When my previous moisturizer did not please my skin, I decided to get another one. Yeap it was that bad till my skin could not take it and bought this Neutrogena before finishing my old one. Neutrogena has been around for quite some time, I remember when I was 15 my friend was using this brand. As years go by I noticed Neutrogena is coming up with more and more range for different skin types in which is great! So why did I choose this product out of the rest? Firstly because I wanted a proper moisturizer that can provide moisture to my skin, unlike those gel type of moisturizer. Although I have super oily skin, it is necessary for me to use moisturizer every day and night. 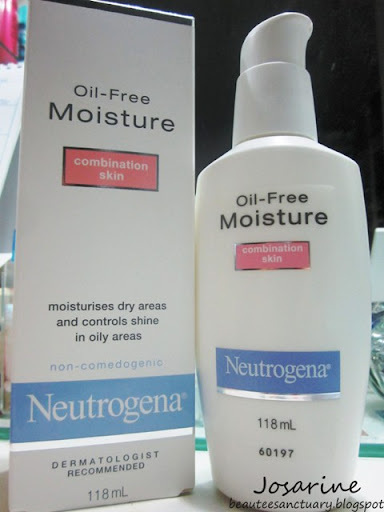 Neutrogena Oil Free Moisturizer for combination skin is proven clinically to normalize combination skin. 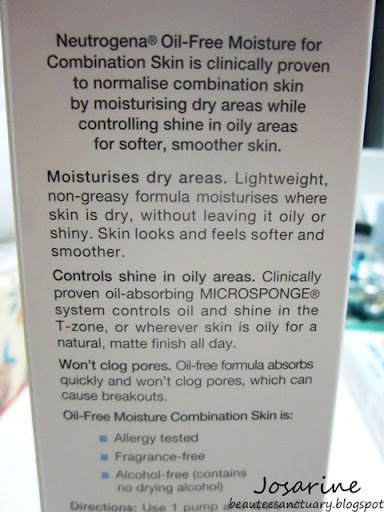 To cut the sentence short, control oily areas and provide more moisture at dry areas. The product is light weight, non-greasy, hence moisturizing the skin without leaving the oily and greasy residue. Will not clog pores, alcohol free, allergy tested and fragrance free. What I want from a moisturizer is to moisturize my skin but at the same time does not leave any sticky or greasy feeling. Some people may prefer gel based kind of moisturizer, but for me the previous gel based product that I used ended making my skin dry and unhealthy looking. This product was able to leave my skin feeling fresh and moisturized without any greasy residue. My skin feels satisfied when it is properly pampered and moisturized, especially after using a Facial Scrub. It is necessary to use a moisturizer especially after using a facial scrub because scrubs are extra drying compared to our daily facial cleanser. However, I was not used to the scent of this product. It stated no fragrance, before this I used to use products that contain fragrance, so a change from that took a while for me to get used to. Sometimes this product makes my face feel a little sticky, so on days when I feel my skin does not need as much as moisture I would pump a small pump, spread the moisturizer on my fingers and tap the moisturizer on my skin instead of the usual application. Affordable, only RM15+ for a 118ml bottle.